Internet marketing memes are memes created for promoting a service or for diffusing an idea through the web. They can be easily built online, with QuickMeme Creator, or offline with any graphic software like Gimp, Adobe Photoshop and more. Here is an easy meme built with the classic image we can find on parked domain names. 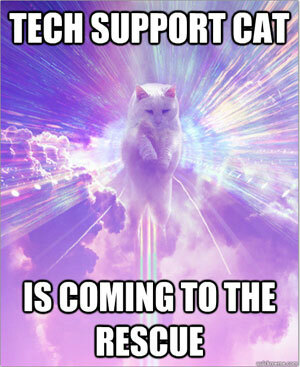 Here is a tech support meme built with a cat image. As you can see their power can spread easily, and every meme that get shared, or even liked, brings you additional traffic. So start to check the most used meme characters, like Philosoraptor, Futurama Fry, Social Awkward Penguin or create your own. You have to create a catchy phrase around your central topic, and adjust it to be as easy and short as possible. The real success of internet marketign memes comes from the funny moments it can provokes. This is how to create a funny meme about your IM niche, try to use them and you will be amazed!